This was a huge enterprise, the latest in an annual series. The BBC pulled out all the stops to involve international soloists, singers and orchestras from far and wide, with all the multitudinous participants listed in the lavish 60 page programme book. We were guided towards our appreciation of "the enigma of Sofia Gubaidulina" by Paul Griffiths, who also provided programme notes for all the items by this controversial composer. A pre-concert interview with the composer did little to help. Christopher Cook asked questions about the music, answers to which were mostly in the programme book on our knees. 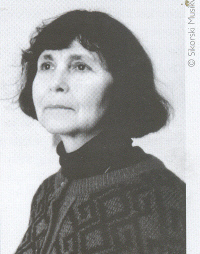 Gubaidulina answered in Russian at length, and Russian music specialist Gerard McBurney summarised her replies briefly in English. Reviewing a recent festival of music by Russian composers after Shostakovich, with Gubaidulina, Kancheli , Schnittke, Silvestrov and the late Ustvolskaya all represented (q.v. my obituary in The Guardian), I expressed an opinion that most of the powerfully expressive works chosen to represent them are better heard standing alone or in mixed programmes. That feeling was confirmed in spades by this weekend festival devoted to Sofia Gubaidulina's music; more proved to be less. Indeed, after several of her more recent scores for large orchestra one came to feel that this annointed empress had few new clothes. I enjoyed The Lyre of Orpheus (Kremerata Baltica/Gidon Kremer, all apparently brought here for that one item) but its companions in a designated tryptich, receiving its world premier, brought diminishing returns. It was hard to listen to The Deceitful Face of Hope and of Despair because the antics on stage of the multi-flautist Sharon Bezaly were embarrasingly distracting (I had liked it on CD BIS SACD 1449). And after the interval Feast During a Plague reached a veritable nadir with the irruption of "an intervention from a new sound source" (Griffiths) - repeated fragments of pseudo-disco music of unbelievable naivety. For some of us the best was another violin concerto, Offertorium (1980, revised thrice thereafter). Championed by Gidon Kremer world wide, we had the opportunity to hear it now from Leonidas Kavakos, who brought to it marvellous beauty of tone, supported by the LSO conducted by Michail Jurowski (father of Vladimir, who is making his mark in UK). 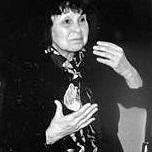 But the grandiose Pro et Contra (1989) brought us back to the excesses of Feast During a Plague, and by this time we had become too familiar with Gubaidulina's expressive clichés and her reliance on huge orchestral forces to mask poverty of substance. Its young conductor Michael Francis (deputising for Gergiev) was not to be faulted, and all the festival performances were well prepared. It has to say something about the composer that some of us felt disinclined to spend a third day with Sofia Gubaidulina, despite having approached her festival weekend with eager expectations. All the music was broadcast live or recorded to be heard on Radio 3 this week. Readers can make up their own minds by utilising the BBC's Listen Again facility throughout the whole week (for listing, select Classical Music - A Journey of the Soul). Reactions for publication will be welcomed by Musical Pointers*. *I listened tonight to Gubaidulina's Alleluia in the final concert, courtesy of BBC Radio 3's Listen Again service. To me, the piece felt like a combination of well structured sound effects. The apparently religious repetitions reminded me of African drumming, Steve Reich/Philip Glass, etc. Originality was not the word which sprung to mind. See also Tim Ashley in The Guardian: The more one listens to Sofia Gubaidulina's music, the less one likes it. Such disenchantment comes, it should be added, from hearing it in quantity - - placed end to end in this year's BBC composer weekend, they revealed startling limitations of emotional range. - - The overall effect is wearing: you feel you've been in contact with sermonising rant rather than visionary spirituality.